Refurbished Fully Ruggardised MEGA High specification Panasonic Toughbook CF-31 Laptop. High performance Intel i5 DUAL CORE 2.4GHz processor, Massive 8GB RAM, DVD multidrive, WIFI, 13.1″ Touchscreen display with daylight readable display, WIFI, 480GB SSD Hard-drive (boots windows in 6 seconds), Windows 7 Professional 64BIT, 2 year warranty excluding battery. HDMI port. 480GB SSD drive – high performance and boots windows in 6 seconds! The toughest laptop in the world made by one of the best manufacturers, Panasonic. Miltary grade , fully weather sealed and made for work in tough enviroments. Unlike many other 2nd user toughbooks, this unit has all port covers intact and is in Grade A condition. Extreme temperature survival from hot in a desert to cold as in Antartica. This toughbook wont let you down and when new it was £4999.99 Available now at a fraction of the price it comes with 2 year warranty UK mainland return to base for your peace of mind (excluding battery). Equipped with RS232 SERIAL port and parallel port it will allow connection to industrial/garage/workshop machines/CNC machines. The item is in excellent condition but it will have marks on it. Comes with Windows 7 Professional 64BIT, ready for work. The item is based on a powerful high performance DUAL core Intel i5 2.4GHz processor, massive 8GB of RAM, WIFI, wired ethernet, 13.1″ Touchscreen daylight readable display and a massive 480GB SSD high performance drive that boots windows in 6 seconds and very rare DVD multidrive. The item has 3 usb ports and SD card reader. It also has connection for a docking station /line out audio, etc. Fanless design its got excellent heat disapation and energy efficiency features. Battery will hold charge but we cannot guarantee how long. This toughbook has been extreme tested with a 40 ton tank driving over it and is the toughest laptop you will get. Tested to MIL American Military standards and is there preferred bit of kit in the battlefield. If you need the optional floppy drive , let us know. 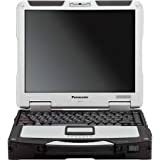 Posts related to Refurbished Fully Ruggardised MEGA High specification Panasonic Toughbook CF-31 Laptop. High performance Intel i5 DUAL CORE 2.4GHz processor, Massive 8GB RAM, DVD multidrive, WIFI, 13.1" Touchscreen display with daylight readable display, WIFI, 480GB SSD Hard-drive (boots windows in 6 seconds), Windows 7 Professional 64BIT, 2 year warranty excluding battery. This entry was posted in Laptops And Tablets and tagged 13.1, 2.4Ghz, 480GB, 64Bit, Battery, boots, CF31, Core, daylight, Display, Dual, excluding, FULLY, Harddrive, High, Intel, Laptop, massive, MEGA, multidrive, Panasonic, Performance, Processor, Professional, readable, Refurbished, ruggardised, seconds, specification, Touchscreen, ToughBook, Warranty, WiFi, Windows, Year by Computer Education World. Bookmark the permalink.